SILICON SLOPES, Utah – November 15, 2016 – Today Domo announced that Jefferson Health, provider of nationally recognized healthcare services, has chosen Domo to improve operational efficiency and enhance the consumer experience. Located in Philadelphia, Pa., the organization is dedicated to providing unparalleled value to its patients and selected Domo as a platform to prototype and implement projects that support that mission. In a matter of months, Jefferson had leveraged Domo to enhance clinical processes and positively impact patient outcomes. One example was leveraging Domo to reduce the latency in getting patients scheduled for chemotherapy. By bringing together relevant data from electronic health and administrative records into one view, decision makers were able to quickly identify areas to address. “We saw an opportunity for improvement in the time it took for a patient to schedule an appointment, so we developed a latency detection system to improve our appointment system. We found there was a lot of latency, not only on the payer side, but also on the administrative side,” said Gomes. With that insight, Jefferson Health was able to take action to decrease the average time it took to get patients into chemotherapy from 22 days down to an average of three and a half days. By aggregating data from all aspects of the emergency department into Domo, and giving all clinicians access to real-time information, Jefferson Health was able to improve efficiency while maintaining the highest standard of care. 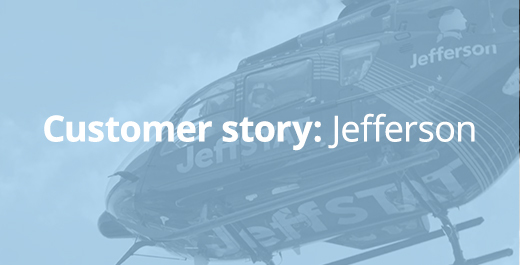 To learn more about Jefferson Health, in addition to how other innovative organizations are using Domo to get more value from their data, visit Domo.com/customers. Jefferson, through its academic and clinical entities of Thomas Jefferson University and Jefferson Health, including Abington Health and Aria Health, is reimagining health care for the greater Philadelphia region and southern New Jersey. Jefferson has 23,000 people dedicated to providing the highest-quality, compassionate clinical care for patients, educating the health professionals of tomorrow, and discovering new treatments and therapies to define the future of care. With a university and hospital that date back to 1824, Jefferson is comprised of six colleges, nine hospitals, 32 outpatient and urgent care locations, and a multitude of physician practices throughout the region, serving more than 96,000 inpatients, 363,000 emergency patients and 1.9 million outpatient visits annually. Domo helps all employees – from the CEO to the front line worker – optimize business performance by connecting them to the right data and people they need to improve business results. Domo’s Business Cloud is the world’s first customizable platform that enables decision makers to identify and act on strategic opportunities in real time. The company is backed with more than $500 million from the world’s best investors and is led by a management team with tenure at the world’s most well-known technology companies. For more information, visit www.domo.com. You can also follow Domo on Twitter, Facebook, LinkedIn, Google+, Instagram and Pinterest. Domo and Business Cloud are trademarks of Domo, Inc.